Dub won a big contest in Indonesia today. Congratulations! The Indonesian Open X-Sport Championships took place in Semarang on Java. Ben Hudson who just joined Fareast Cycles (remember his awesome welcome edit?) got second before Shintaro who is in third place. Photo: from Dub's Facebook. He also posted a comment: "Traveling is a blessing, FLATLAND is my passion, sharing both with friends is priceless. Such a great time spent with @benjam1n_hudson and Shintaro this weekend, but also with @taslemraziff @aisbmx @heruanwari @botayflat @dickypenumbra and many more. 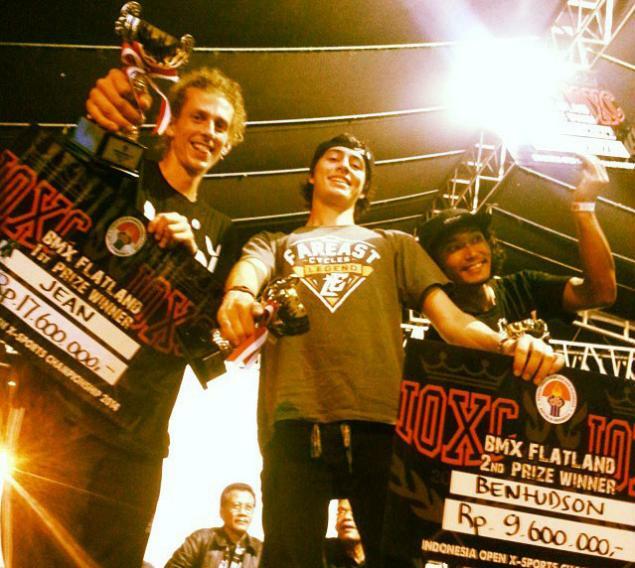 Big up to the Indonesian BMX scene! May the good vibes be with you! Thanks @asosiasibmxindonesia and see you next year in Bandung!"